Once a judge has signed your divorce decree, it's usually a done deal.. While it's possible to vacate a divorce decree in Oregon, it's not easy. The Oregon Rules of Civil Procedure specify the grounds a court will consider in deciding whether to overturn your divorce. There are a limited number of reasons and the court tends to construe them narrowly. Even false testimony or the concealment of assets during a divorce proceeding might not be enough to enable you to vacate your divorce. 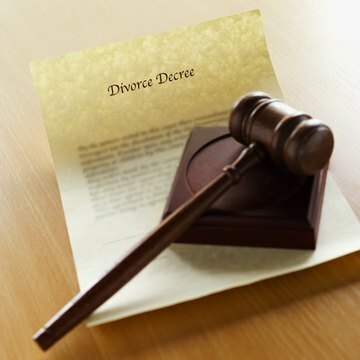 A divorce decree is a formal order that legally terminates a marriage. The court's judgment is finalized when the order is signed and dated by the trial judge and court clerk. A divorce that is vacated is formally set aside or annulled. Legally, vacating a divorce means it never happened, so the parties are restored to their former status. In short, if you filed for divorce while you were married or separated, you'll once again be married or separated if the decree is vacated. Under section 71 of the Oregon civil procedure statutes, you can ask the original court that granted the divorce to vacate it on the grounds of mistake. For example, your case might have been filed in a county without jurisdiction to hear the matter. A mutual mistake by both parties also can be alleged as a reason to vacate the divorce. The discovery of new evidence that wasn't known or discoverable at the time of the divorce also can be the basis of vacating a divorce decree. Oregon rules allow you petition the court to set aside a divorce decree if you can prove fraud, misrepresentation or misconduct by the other party. Proving fraud generally requires you to show that a false representation of fact was made by the other party, who either knew the representation was false or acted with reckless indifference to the truth. In addition, the false representations must be made with an intent to cause you to act in ways that are detrimental to your own interests. However, the burden of proof in Oregon is high and you must present "clear and convincing" evidence. A disproportionate division of assets, in and of itself, is not considered fraudulent, nor is the appearance of impropriety. In an Oregon case involving visitation rights, In Re Samuel Andrew McLaughlin, the Court of Appeals wrestled with a provision of section 71 that gives state courts the "inherent authority" to vacate a judgment or decree. Case law in Oregon requires the petitioner to show that "extraordinary circumstances" require vacating the judgment. The court wrote that extraordinary circumstances "typically involve some sort of fraud or overreaching by one of the parties." But the appeals court added that a judgment that proves to be erroneous does not automatically rise to the level of "extraordinary circumstances," and thus cannot be vacated. In another case, perjury was insufficient to demonstrate "extraordinary circumstances." Obtaining a divorce means severing a legal relationship. As such, rigid legal rules and procedures come into play. In Florida, if one spouse fails to observe the filing requirements, the court may dismiss the action. Cases may also get dismissed by voluntary agreement if a couple decides to stay married. Paying close attention to the Florida court rules from the outset will help you avoid having to file for divorce twice. How Long Do You Have to File an Appeal for Divorce in Arizona? If you can't reach an agreement with your spouse as to how to end your marriage, you run the risk of having a judge decide things for you at trial. Your life – and all the things that matter most to you – end up in a judge's hands, subject to his discretion and decisions. He may or may not agree with your arguments, and he's only human. He can make mistakes. In the latter case, Arizona law gives you options for setting things right, but you won’t have much time to act.